We are proud to announce that Bart & Associates has been chosen by the Northern Virginia Chamber of Commerce as a nominee for the Outstanding Corporate Citizenship Awards in the Mid-Size Business Category. 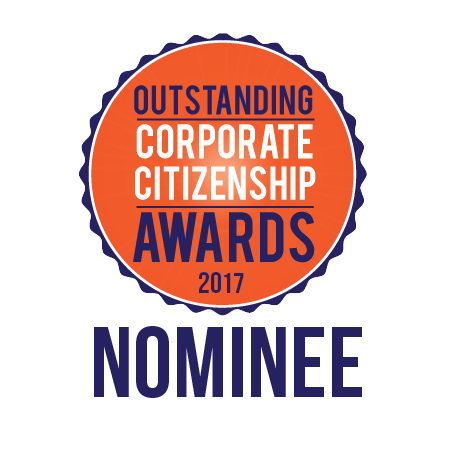 In addition, both Jonathan Evans, President, and Shannon Hagy, VP of Strategy and Business Development, have been selected as nominees for the Outstanding Corporate Citizenship Awards in the Executive Leader Category. The Northern Virginia Chamber of Commerce, Outstanding Corporate Citizenship Awards honor individuals, businesses, and non-profits for above-and-beyond business leadership, employee engagement, and corporate social responsibility. The Awards will be held Wednesday, June 14, 2017 at the Hilton McLean Tysons Corner. “We are honored to not only have our company nominated for this award, but also our President and one of our Vice Presidents,” says Kion Yap, CEO of Bart & Associates, “I’m proud of the commitment to philanthropy and social responsibility that have been established at B&A”. Employees across Bart & Associates (B&A) contribute their time and talents to supporting a variety of causes such as Shine on Casey which awards a scholarship to a graduating senior from a local high school; Rebuilding Together Montgomery County which provides free critical home repairs, energy efficiency upgrades, and accessibility modifications to the county’s most vulnerable residents; the Cardinal Bank Classic which supports non-profit initiatives in the areas of children and families, healthcare and wellness, arts and humanities, and educational services; Chance for Life which supports pediatric cancer; Celtino foundation, founded by B&A’s Executive Vice President, Jesus Medrano, which promotes education in rural Latin America by building schools, providing supplies, and granting high school scholarships; Asian American LEAD which supports low-income and underserved Asian Pacific American youth with educational empowerment, identity development, and leadership opportunities; and Hope for Henry Foundation which supports the lives of critically ill children. Both executive leaders nominated by the Northern Virginia Chamber of Commerce have demonstrated their commitment to corporate citizenship. B&A’s President – Jonathan Evans, served on the Washington Business Hall of Fame Committee Board which supports Junior Achievement of Greater Washington promoting the delivery of standards-based experiential financial literacy, work readiness, and entrepreneurship programs that are taught by a volunteer role model from the community to prepare the region’s future leaders. Now Jonathan Evans serves on the Board of Directors for the Hope for Henry Foundation, an organization dedicated to reinventing how hospitals care for seriously ill children and their families through innovative programs that entertain, reduce stress, and empower children to be active participants in their own care. Since its inception, the Hope for Henry Foundation has served more than 18,000 children. Jonathan Evans is the President of Bart & Associates. He is responsible for managing the day-to-day activities of the organization, delivering against the strategic plan, improving revenue and market share, and overall growth of the company. B&A’s Vice President of Strategy and Business Development — Shannon Hagy, serves as the President of AFCEA Bethesda, a non-profit that encourages dialogue and partnership between the federal government and industry. Through this organization, Shannon has been involved with AFCEA Bethesda’s “A Night for the Children” gala benefiting charities that support children and families in need. She has been a strong proponent of AFCEA Bethesda’s scholarship support in which the chapter provides funding to STEM education programs across its university partners. Shannon also works closely with the Women’s Center, an organization that provides counseling, support, and education to help people live healthy and productive lives. She has lead the sponsorships for the Women’s Center Gala for three consecutive years. Shannon Hagy is the Vice President of Strategy and Business Development for Bart & Associates. She is responsible for managing a broad range of business development pursuits across the company.